If you are looking for new ways to explore the fretboard, or new sounds to investigate – the books in The GuitArchitect’s Guide To…. series are for you!! Print and PDF editions of this book are available on lulu.com and print editions can be found on Amazon (amazon.com, amazon.co.uk, or amazon.fr). 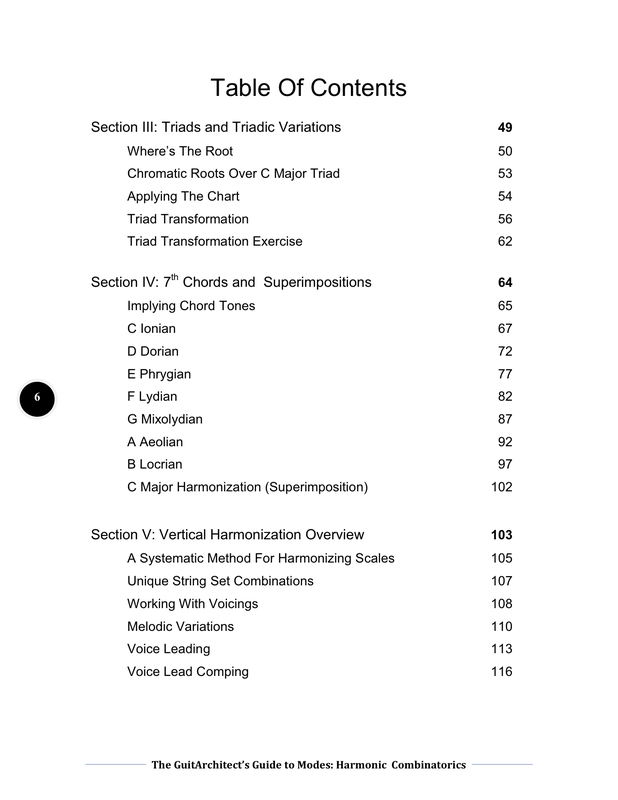 In The GuitArchitect’s Guide to Modes: Harmonic Combinatorics, I’ve gone into the nuts and bolts of chord construction and analysis by taking a systematic approach to generating thousands of chord variations that can be utilized intuitively in any key. 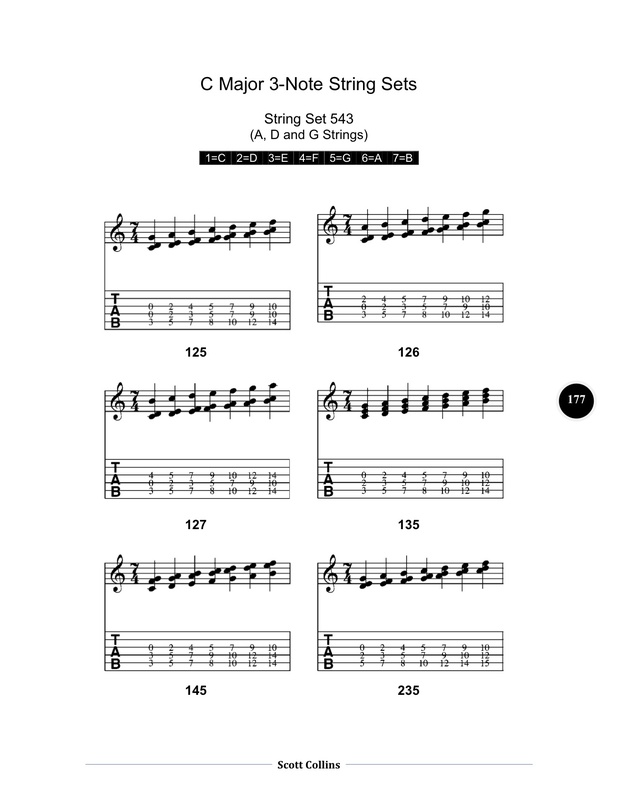 In addition to being a vast harmonic resource, I also show you ways to make melodic lines from this material allowing the book to double as a melodic resource as well. As a general rule, I’m not a big fan of jargon, but in this case I think its applicable as it helps define what this book is, and what it isn’t. 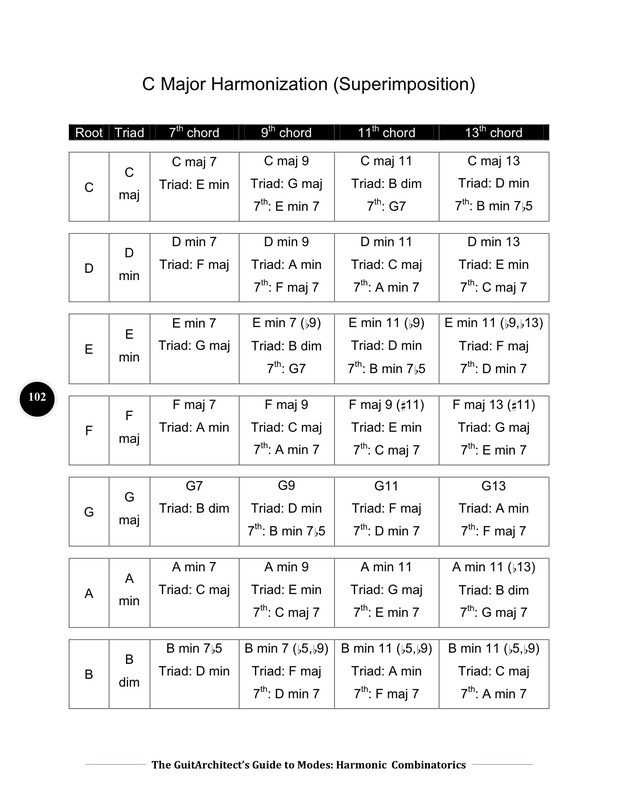 This is not a traditional chord book. 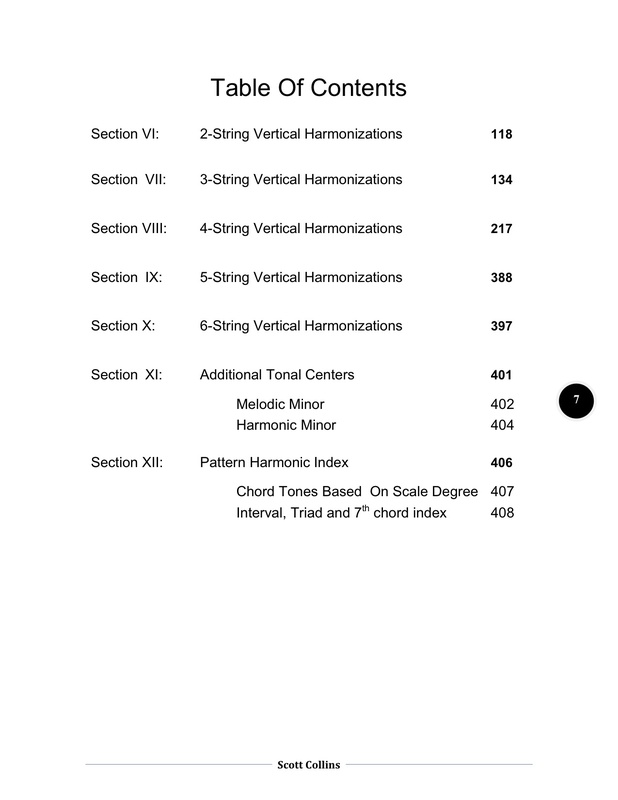 The purpose of this book is not to teach a number of stock voicings and typical chord progressions for the reader to default back to as there are dozens, if not hundreds, of books that already do that. 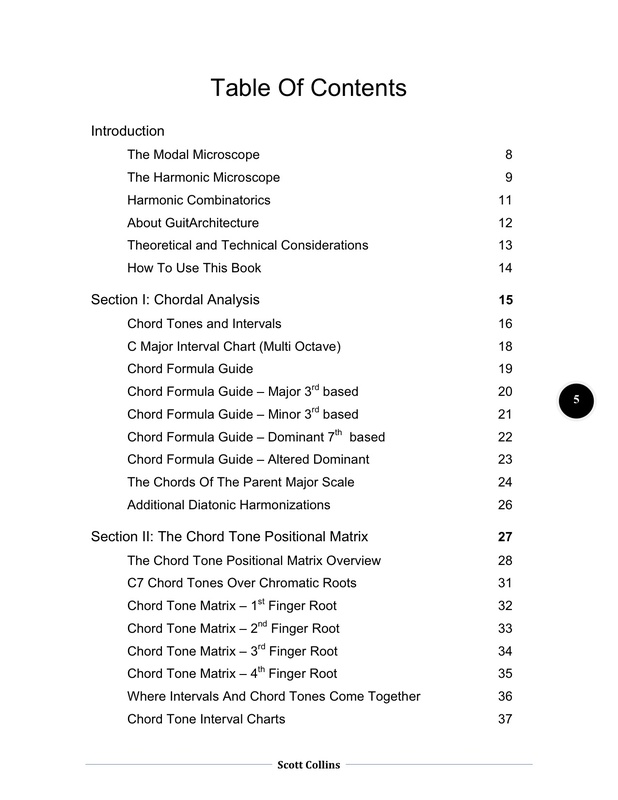 This book centers around a series of methodologies for developing unique harmonic and melodic voicings for compositional or improvisational use that can be adapted to any tonal system. Harmonic Combinatorics refers to a process of identifying “countable discrete structures” harmonically. 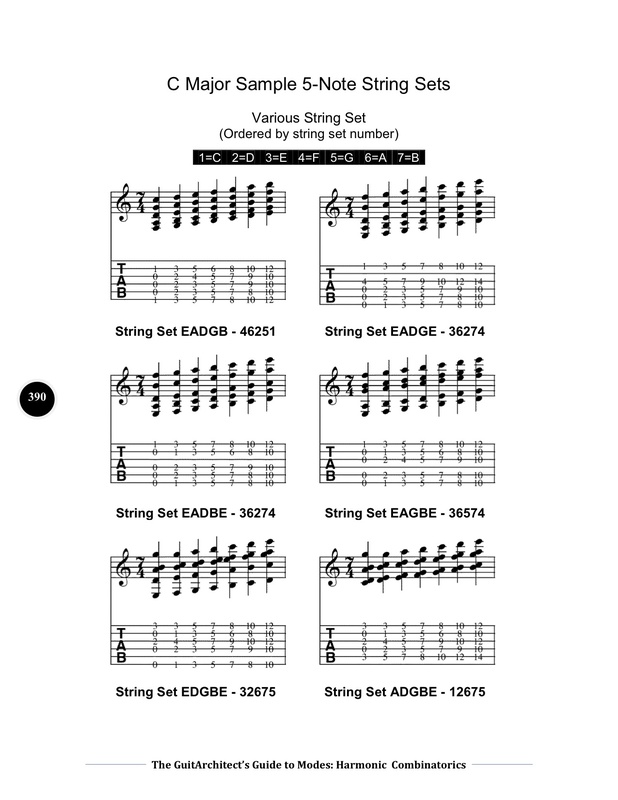 In this case, it means examining unique combinations of notes on all of the possible string combinations for the purposes of developing harmonic and melodic possibilities. The book is divided into approximately 110 pages of instruction and 300 pages of reference. It covers a lot of theory – but makes it accessible even to the novice and shows how to apply it. It’s a modular text that can be read in either a linear or a non-linear way. RECYCLING CHORDS PART I OR WHERE’S THE ROOT? I’ve included jpegs of some of the pages from the Harmonic Combinatorics book below. Since the jpegs were converted from the pdf of the book, there’s some pixelation in the jpegs that’s not present in the pdf, but these will still give you an idea of what’s in the book. Print editions of this book are available individually here (lulu.com) or on Amazon (amazon.com, amazon.co.uk, or amazon.fr).